Universal Metal Products (UMP) specializes in custom metal forming including high volume appliance, automotive and industrial metal stampings. When they wanted to redesign their website, we offered the Small Business Division as an affordable solution. The result is a responsive website that not only beautifully highlights the company's capabilities, but also allows customers to view the site in five different languages with the click of the mouse. And the easy-to-use content management system means the UMP team can keep the website current and fresh. 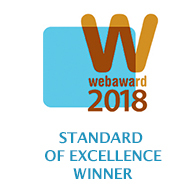 We are pleased to announce that the Universal Metal Products website has been awarded a 2018 WebAward in the category of Manufacturing Standard of Excellence!